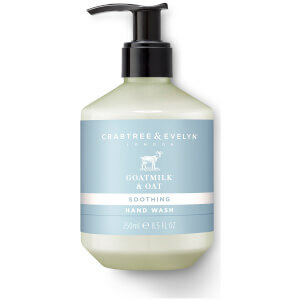 Cleanse and soothe delicate, sensitive skin with the Crabtree & Evelyn Goatmilk & Oat Hand Wash. Formulated with the signature blend based upon free-range Goat’s Milk and Glycerin, it gently washes away dirt and grime with a cashmere-soft lather that doesn’t strip away moisture. A delicate balance of Oat Kernel Oil, Vitamin E and Honey help replenish and repair, creating a calming sensation whilst alleviating dry patches for hands that feel purified, supple and rejuvenated with a clean, fresh scent. Ideal for particularly reactive and sensitised skin types. Apply to wet hands. Work into a lather and rinse.